I went to my cousin's birthday recently and I spotted this salad when it was time for lunch, it looked amazing, different actually, something I had not tried before, something I would like. So I grabbed a spoonful, not too much, for what if I didn't like it. Well I did, I loved it, I went back for seconds. It was so nice, so tasty, but with each mouthful you are trying to figure out what is in it, what is the dressing. This salad is one of my favourite salads, it is something I probably wouldn't make every day as I like lighter salads, salads with oil and vinegar based dressings, but for parties, this is a real crowd pleaser. Also with this salad the ingredient amounts are a guide, you can add more or less of some things. For instance I decreased the sugar amount, 1/4 cup would have made it too sweet for me. 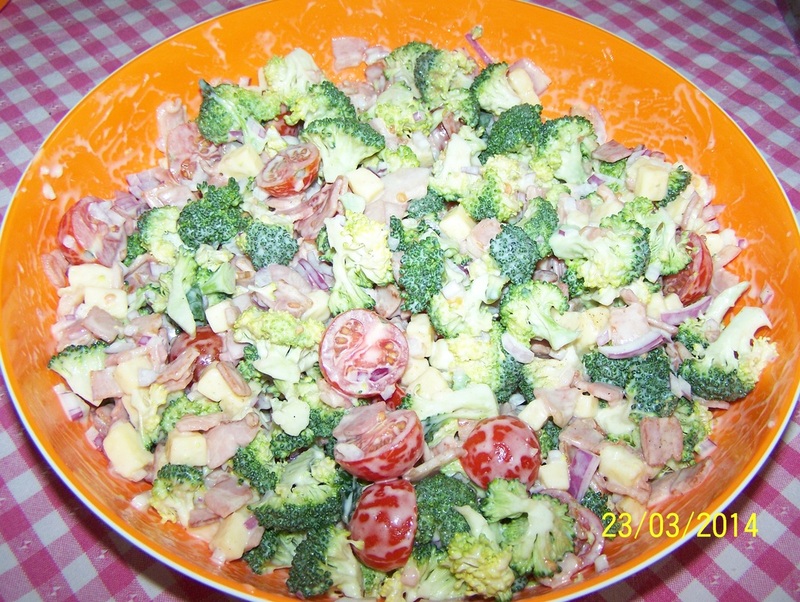 Add more tomatoes if you like, more broccoli, use less bacon etc. Once you make it for the first time, you alter things to suit you. Each mouthful is amazing, truly lovely. I had to find out who made it. Thank you Silvana for sharing Paula Deen's recipe. Trim large leaves from broccoli stem. From the broccoli stalk remove the outer 'tough' layer using a knife. Cut off 1/2-1cm from the end of the stalk as it is tough also. Wash the broccoli. Cut the head into small florets and the stem into bite sized pieces. Place in a large bowl. Add the bacon, onion, cheese and tomato. In a small bowl, combine the mayonnaise and vinegar. Add sugar, to taste. Season with salt and pepper. Add the mayonnaise mixture to the broccoli, toss gently to combine.